Earn $11.69 in Rewards credit (1169 points) What's This? 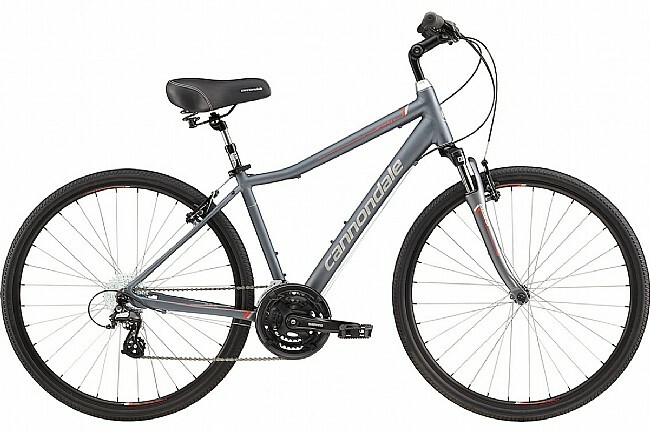 Cannondale’s 2018 Adventure 2 Hybrid Bike features a lightweight SmartForm C3 Alloy frame, sturdy construction, and comfortable upright geometry with an easy step-down; ideal for city riding and commuting. Frame Material: SmartForm C3 Alloy. Fork: SR Suntour SF-15, 50mm, 1-1/8". Shifters: Shimano Revo Twist Type. Cassette: Sunrace CSM66, 11-32, 8-speed. Handlebar: Cannondale C4, alloy, 620 x 50mm rise. Stem: Tranz X Comfort, Adjustable, quill-type. Seatpost: RST Suspension, 40mm travel, 27.2 x 350mm. Rims: Maddux DC 5.0, double wall, 32-hole. Tires: Kenda Kwick Trax, 700x38c.